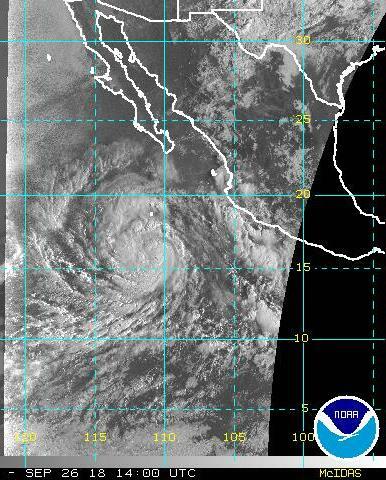 Visible satellite image above of Rosa at 10:00 am MST this morning indicates that the storm is rapidly weakening. The concurrent IR image indicates that deep clouds and convection remain active only to northeast of storm center. 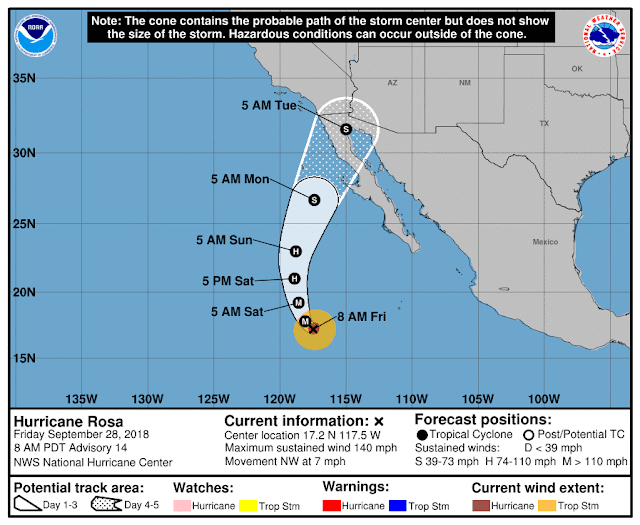 The NHC track forecast (below) from 8:00 am remains little changed, and also tries to keep Rosa at TS strength (winds > 39 mph and < 73 mph) into northern Baja. Thunderstorms have developed this morning out near the west boundary of Pima County - composite radar above from Yuma at about 10:30 am. Models remain consistent in forecasting widespread and significant precipitation event for Arizona. However, the QPP forecasts continue jumping around considerably with each new forecast cycle. Two forecasts below are both from today: 00 UTC WRF-GFS for total rainfall, while bottom is from 12 UTC WRF-NAM. Note that one forecasts 0.40 inches at the airport, while forecast from this morning indicates 1.90". Swath of heaviest rainfall continues to run from Organ Pipe National Monument across Phoenix metro area and into Rim Country. The graphic above shows MIMIC TPW at 6:00 am MST this morning. Hurricane Rosa is near 20 degrees north, and now moving toward the north. PW values around 2 inches have now spread to nearly 30 degrees north, and will be increasing steadily late today and tomorrow over southern Arizona. Plot below shows detected CG flashes over Mexico for 12-hours ending at 12 UTC this morning (from Atmo and Vaisala). Thunderstorms were active during the night and have spread northward into southern Sonora. The synoptic pattern which will steer the decaying hurricane remains very complicated, as two waves at 500 mb interact and the western wave (now south of Aleutians) appears to be the one that will steer the remnants of Rosa across parts of Southwest. The local WRF forecasts (driven by the operational NAM and GFS) are forecasting a more eastward track than is NHC. The system is forecast to cross the northern GoC as a rapidly weakening depression. The situation remains very difficult wrt to possible rainfall amounts. The 06 UTC WRF forecasts now indicate heaviest amounts in Arizona to occur over western Pima County and also over the mountains northeast of Phoenix. The forecast below is from the 06 UTC WRF-GFS and is valid for period ending at midnight on October 2nd. 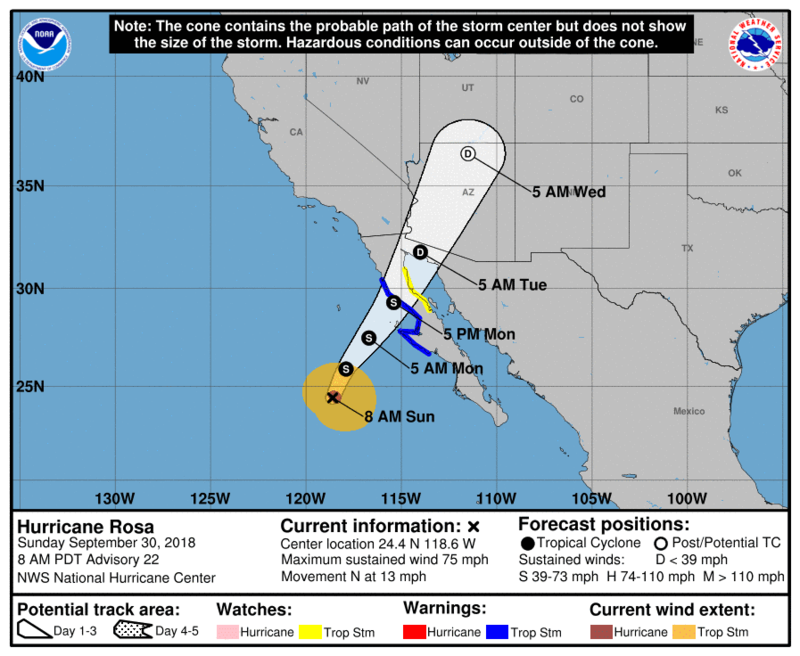 Compare with the forecast in previous post to get a feel for how much the forecast impacts of Rosa have shifted eastward. As with many decaying tropical storms, the details of the forecasts for Arizona remain very difficult. Had internet problems this morning and am only taking a quick look at Rosa. Category 4 Hurricane Rosa is now turning northward. Image above is IR from 8:00 am MST. Below is current track forecast track from NHC - remnants still forecast to move into southwestern Arizona near Yuma. The 00 UTC WRF GFS forecast of total precipitation through 5:00 am on October 3rd is shown second below. If this forecast verifies, then very heavy rains impact western Arizona, with amounts decreasing rapidly to east of track of storm remnants. The current GEFS QPF plumes are also indicating the west-to-east decrease in potential rain amounts. The NHC has rated Rosa at Category 3 strength this afternoon. 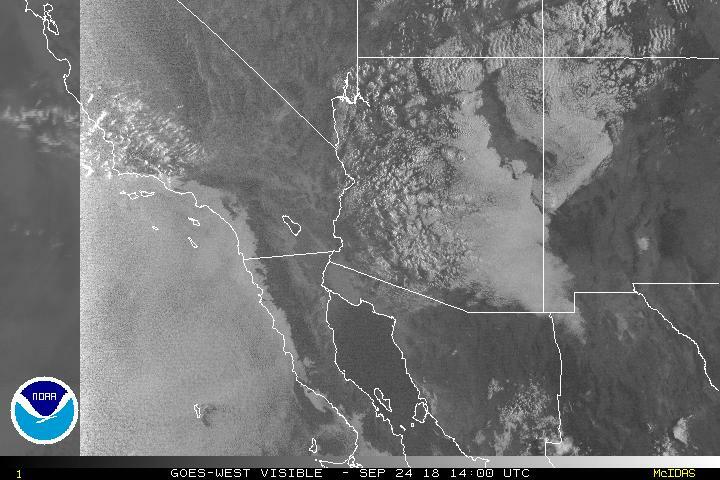 The visible image below is from 2:00 pm MST. At bottom is current NHC track forecast. The morning track forecast for Rosa (above) and intensity forecast (below) is from JTWC, which provides a bit more detail in their forecast graphics than does NHC. 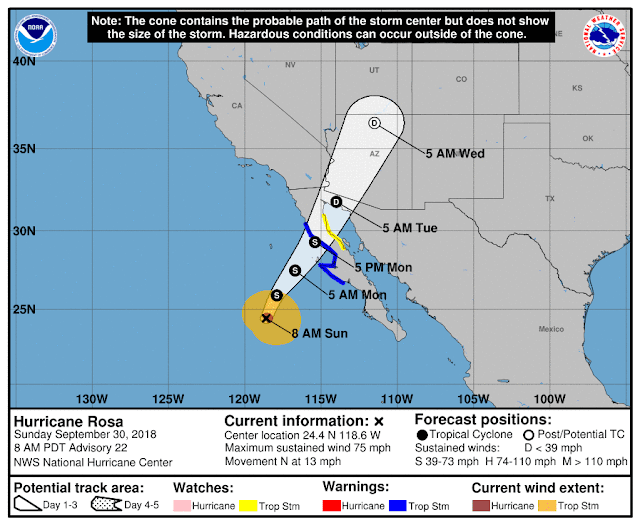 The centers continue to forecast Rosa to be headed toward northern Baja and southwestern Arizona during the day on October 2nd. The QPF plumes from the 06 UTC GEFS forecasts last night are shown here - from top to bottom - Yuma, Phoenix, Tucson, and Deming NM. The spread for forecast amounts at Yuma and Phoenix is near 4 inches and at Tucson and Deming about an inch and a half to two inches. Rosa poses a threat to bring significant rains to the Southwest - but that threat currently extends from southern California all the way to southwest New Mexico. All of the plume forecasts also have some members forecasting amounts near zero. Thus, with the possible event four days away, it is important to talk about the developing threat of heavy rains and flooding, but it is still too soon to talk about specific amounts expected for the Tucson area. 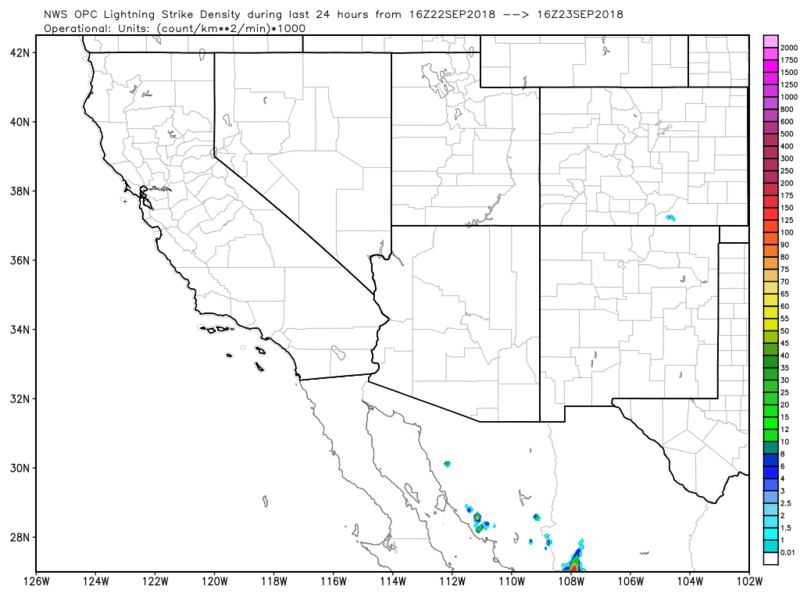 Yesterday was again suppressed wrt thunderstorms across most of Arizona (exception - some storms along the Rim into the White Mountains) and northwestern Mexico. Graphic below shows CG flashes for 12-hours (from Atmo and Vaisala) and captures considerable thunderstorm activity within portions of Hurricane Rosa's circulation. The PW is decreasing, while cooler mid-level air is moving south across Arizona - we end up having stable conditions much of rest of month because of the drying. The current WRF models forecast no activity our area until the moisture increases from the south on 30th and 1st of October. 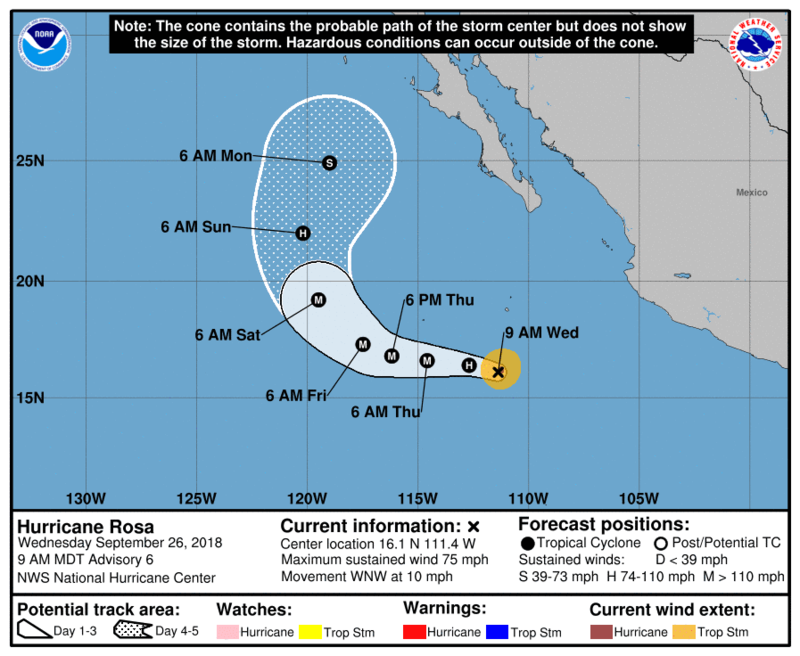 Rosa is currently a Cat 1 hurricane and is forecast to intensify rapidly. 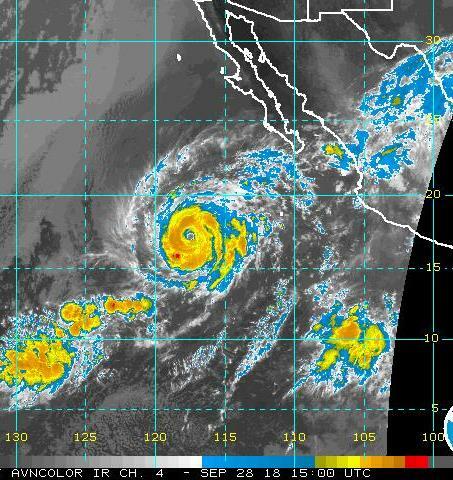 Above is visible image showing Rosa at 7:00 am MST and below is NHC's forecast for Rosa from this morning through am on October 1st. 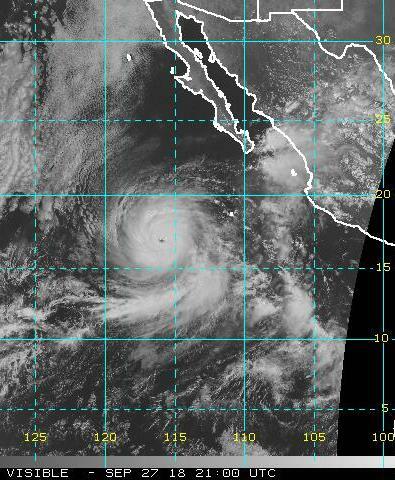 The hurricane is rapidly strengthening and is forecast to become a major storm. 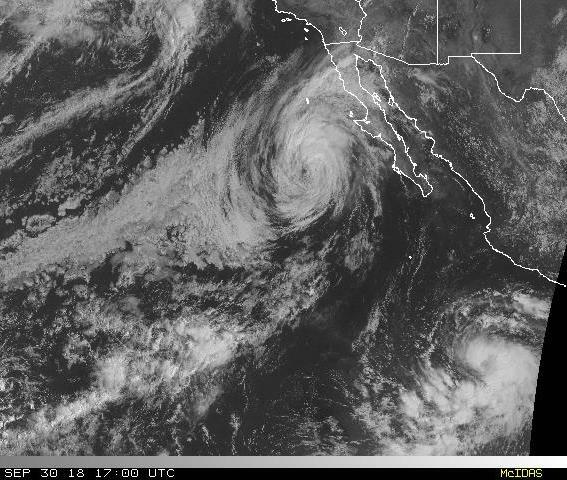 But once it moves northward over cooler SSTs west of south end of Baja it begins weakening. The exact path that the remnants of Rosa will follow is not really forecastable at this long-lead time. 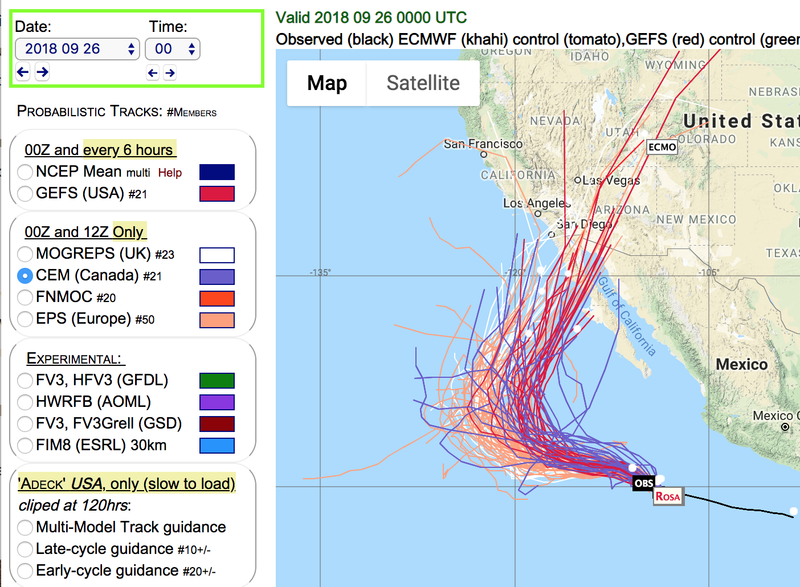 Forecast tracks from ensembles of several global models shown above indicate a very large range of possibilities at this time, and current NHC forecast is essentially the mean of these possibilities. However, the hurricane's track and turn northward should result in its triggering a strong surge of GoC moisture into southwest Arizona and southern California. The forecast below (from 00 UTC WRF-GFS on 5.4 km grid) is of PW valid at 12 UTC on October 1st. The return of subtropical moisture should lead to increasing shower and storm activity - we will have to wait for several days before we will get a feel for where and how much. Those who have been here for more than a few years know how very fickle events with remnant tropical storms can be. Our neighbors, John and Jodi Ferner, were at the Grand Canyon with visitors yesterday. 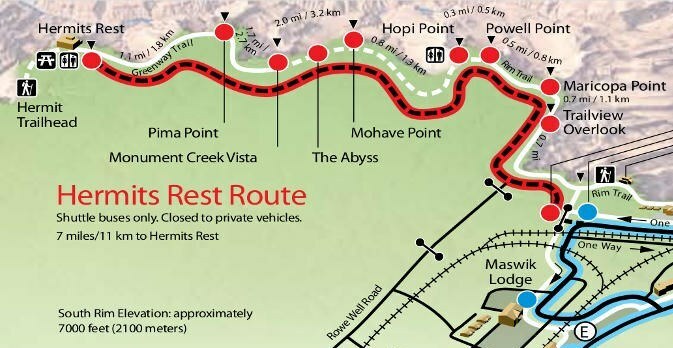 They were at Mojave Point when thunderstorms struck (map above shows Hermit's Rest Road, which is only open to tourists via shuttle buses). Map below (from Atmo and Vaisala) shows detected CG flashes through midnight last night, with thunderstorms restricted to the high country of northeastern Arizona (nothing within hundreds of km of the metro area). Here are the TWC skew-T plots from last evening (above) and this morning (below - both from SPC). During the afternoon yesterday the well-mixed BL grew to a bit above 700 mb, but the strong inversion and capping layer above 550 mb persisted and kept storms from developing. This morning the inversion has lowered some to around 600 mb and PW has decreased to just over an inch. There is virtually no CAPE this morning, and as long as inversion persists, no chance for thunderstorms. The current WRF forecasts for this afternoon indicate isolated sprinkle showers but no thunderstorms. Forecast models keep southern Arizona very quiet, until start of October when a tropical system may push deep moisture back into our area. So much for yesterday's post that there'd not be much to watch, except the thermometer, for rest of September. Skies were overcast with middle cloud at sunrise and temperatures were very warm (78 F here at 7:00 am MST) and dewpoints had jumped into 60s. Very muggy walking compared to last couple of days. The PW jumped last evening across much of southern Arizona. Although the 500 mb trough (above) is over southern California this morning, below 600 mb it has led to a distinct trough over GoC, which has kicked higher PWs back into our area. The skew-T plot for 12 UTC TWC upper-air data (below- both from SPC) has PW of 1.32" - which is up half an inch from late yesterday afternoon. Although lower levels have potential CAPE, a very nasty, capping inversion persists at 550 mb (500 temperature is a very warm -3 C). Key question of the day is whether or not some middle-level cooling will swing around the bottom of the trough (coupled with how deep the surface-based BL will grow)? The available WRF forecasts go as per: the 06 UTC NAM version forecasts some isolated, light sprinkle showers around; the GFS version indicates showers and perhaps a couple of thundersotrms for central Pima County and isolated sprinkle showers for our area; and 12 UTC WRF-RR forecasts isolated showers and storms for eastern Pima County. The forecast soundings appear marginal for thunderstorms because the inversion aloft remains pronounced, although models forecast it to lift up to 500 mb, or bit above. Model forecasts tend to smooth vertical structures, and it appears that the capping layer could remain quite significant through the day. However, something to watch already. Above is 7:00 am visible satellite image. While it appears to be stratus or fog, the area from southeast corner of state north-northwestward to Grand Canyon is uniform middle-cloud overcast, from surface observations. I thought that the clear gap in northeast was over the Little Colorado River, but Winslow obs indicate overcast conditions. 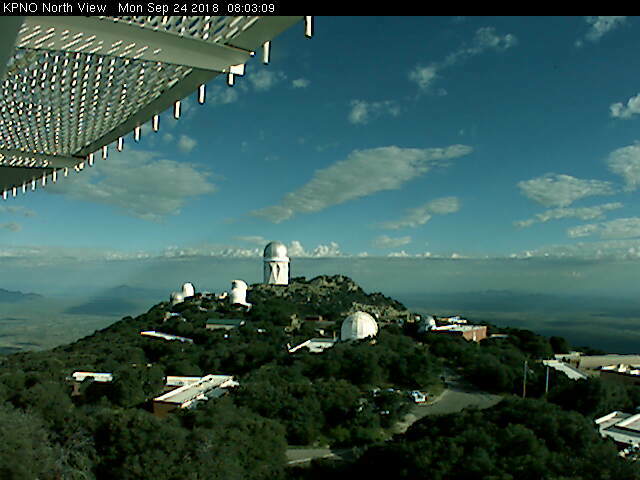 Below is view north from Kitt Peak at 8:00 am - this looks to be moderate buildups above a middle cloud layer - with dirty boundary layer and cloud shadows beneath. Yesterday was very suppressed, WRT to thunderstorms, across the entire Southwest. Flash density above (from weather.graphics and Vaisala) is for 24-hours ending at 9:00 am MST this morning - as quiet as I've seen the entire Southwest in a very long time. Forecast below is from the 06 UTC WRF=GFS (on 5.4 km grid) and is for total precipitation through September 30th and is very dry forecast for most of the Southwest. Little chance of rain or thunderstorms, along with very warm highs in the 90s seem likely to prevail here until October. Update re gusty east winds - airport has gusted briefly to 31 mph and we had gusts along the Rillito from mid-morning to early afternoon of 30 to 35 mph. Mt. Hopkins RAWS site has gusted as high as 61 mph (below), showing how well the WRF forecasts can be used to predict high wind events there. A Plains cold front is moving southward across west Texas and northeastern New Mexico this morning - surface plot above from NCAR RAP at 7:00 am MST this morning. The front will backdoor across southern Arizona tonight and tomorrow bringing gusty winds from the east. Forecast above of 10-m winds is from the WRF-GFS at 06 UTC and is valid at 4:00 am tomorrow morning. This forecast indicates possible gusts around 30 mph for the metro area after midnight and into the morning tomorrow. The forecast skew-T for Sonoita (below from same run and valid at 7:00 am on 22nd) indicates east winds below 700 mb of 20 to 30 kts - this forecast, if it verifies, would bring an east wind event to Mt. Hopkins during the night with gusts in 45 to 65 mph range. 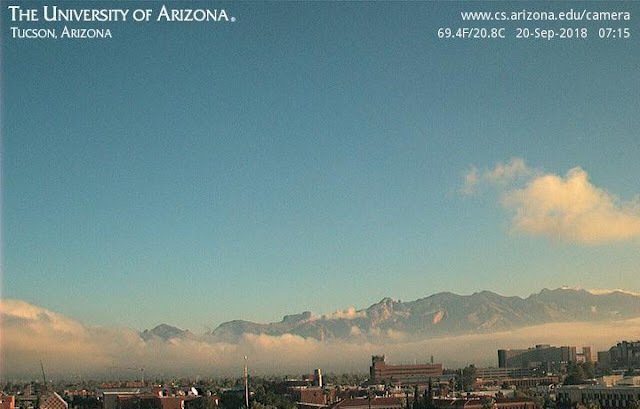 Yesterday's widespread heavy rains left behind very moist air that led to fog and stratus fractus this morning. Above photo from about 6:30 am MST along Rillito - Finger Rock through the fog. Below is view from campus at 7:15 am. The event yesterday (somewhat similar to the June event) resulted from a tropical moisture intrusion interacting with an advancing trough in the westerlies. Also playing a role was TD-19 (as per NHC); however, Art Douglas sent along observations from Mexico that indicate the system was likely a tropical storm in the lower third of GoC. Plot of detected CGs above (from Atmo and Vaisala 24-hours thru 10:00 pm last night) shows that thunderstorm activity with the event was quite limited and mostly occurred before noon yesterday morning. Significant amounts of rain fell across the entire ALERT network - plots ending at 5:00 am for north portion above and south portion below. There were 45 sites that recorded over an inch of rain and 16 had over two inches. The two reports of more than three inches came from Samaniego Peak in the Catalinas and from Altar Wash at Highway 286. Here at house we had 0.65", while airport had 0.76", as did Atmo (DM ASOS has been out of service a couple of days). The Rillito was flowing this morning and apparently had reached bank-to-bank levels at a couple of spots between USGS gauge at Dodge and the Campbell Ave. bridge. Plot second below shows the flow peaked at about 2700 cfs around midnight. The WRF forecasts indicate a quiet day today, with perhaps some storms over mountains off to east. While low-level moisture persists, dry air is intruding across Arizona at middle and high levels and this will cap deep convection. The MIMIC plot below is from 6:00 am and is the analysis of PW in the layer 700 to 500 mb - very dry air west of the 500 mb trough. The longer-term global forecasts indicate some hope for another intrusion of tropical moisture before the month closes out. An unusual sunset last night with lavender hues (above), while there was a more distinct orange to purple sunrise this morning (bottom). Thunderstorms yesterday were mostly southeast to southwest of Tucson (as per detected CG flash plot above for 24-hours ending at 12:30 am MST this morning - from Atmo and Vaisala). The interesting sunset colors were in the anvil clouds coming from Santa Cruz and a tiny corner of Pima Counties. Four ALERT sites had rainfall of 0.04" and more last evening between 5:00 and 10:00 pm - these were the southern stations with very slight amounts, except Arivaca at 0.47". Nogales reported 0.45". This morning Arizona is increasingly under the influence of the approaching West Coast trough - analysis of 12 UTC 250 level from SPC. A piece of that trough appears to extend down the GoC and will likely be an important player in today's weather events. Also of interest is the distinct Rex block over south-central U.S. The morning skew-T plot of TWC upper-air data (below, also from SPC) indicates PW up to 1.75" in a very wet atmosphere. Winds aloft are better organized, veering from southeast at 600 mb to southwest in upper-levels. The old, surface based BL appears to have over 1000 J/Kg CAPE, but with considerable lift required to reach the LFC a bit above 700 mb. 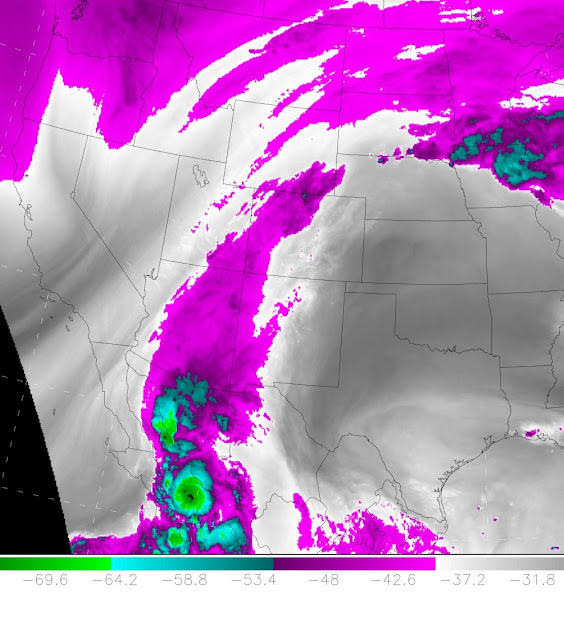 The upper-tropospheric water vapor image above, for a bit after 7:00 am, shows the huge plume of moisture from south end of GoC north to southeastern Wyoming. Looks like very little solar heating during the day, so the approaching trough from GoC will be important for our local rainfall. The model forecasts agree on rain today at TUS but possible amounts have large range. The 12 UTC WRF-RR (below) forecasts 1.2" through 6:00 am tomorrow morning (06 UTC NAM version forecasts 0.3" and GFS version is at 0.8"). This version of the model forecasts extreme amounts of up to over 6 inches on the mountains of Santa Cruz and Pima County. The 06 UTC GEFS plumes for Tucson indicate a QPF range from 0.2" to 1.25" through 6:00 am tomorrow. Thus, a wide range of possible scenarios for the day - will sit and watch now. - I see that current radar indicates that a large thunderstorm has already developed west of Tubac - an interesting start.